Top Australian cyclist Amy Gillett was killed and five other national team members were hurt when they were hit by a car while training in Germany. Louise Yaxley and Alexis Rhodes are in intensive care with multiple injuries while Katie Brown, Lorian Graham and Kate Nichols are in a stable condition. Gillett, 29, took up competitive cycling in 2000, having rowed for Australia at the 1996 Atlanta Olympics. She later married world champion rower and Australian coach Simon Gillett. The riders, members of the Australian Institute of Sports (AIS) women's road cycling squad based in Italy, were out preparing for the Tour of Thuringen when the incident occurred. German police said the car's driver, an 18-year-old learner, lost control of her vehicle between the towns of Zeulenroda and Auma. 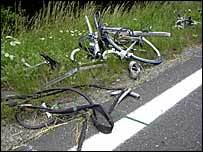 "She then ended up on the oncoming lane and that's where the collision with the six cyclists happened," said prosecutor Ralf Mohrmann. Police have not been able to question the driver, who was also seriously injured, but authorities have not ruled out manslaughter charges caused by negligent driving. Team coach Warren McDonald told the Sydney Morning Herald: "The woman driver just suddenly veered across the road and hit a bunch of girls." The injured were evacuated by helicopter to five hospitals around Leipzig following the incident on Monday. Cycling Australia chief executive Graham Fredericks said Yaxley and Rhodes were in "very serious" condition in hospital. Yaxley, 20, suffered "major trauma" that required surgery while Rhodes, 23, had a thoracic fracture and serious concussion. "Obviously that will take a fair bit of monitoring. Hopefully she will pull through but at the moment she is still in intensive care," said Fredericks. He added that Brown, 22, had suffered a badly fractured leg, Nichols, 20, had sustained soft tissue damage and torn tendons in her hand while Graham, 27, had multiple fractures of her knees, fingers and both collarbones. It is not known if any of the riders will be able to compete at the top level again. Australia's sports minister, Rod Kemp, said: "It's a very sad day for Australian sport and it's a tragedy for the individuals involved and their families. "It's probably the worst accident in sport that we've had for a very long time and our hearts go out to these young cyclists, particularly of course to the family of Amy Gillett." Fredericks added: "Our focus now is on the well-being of those athletes ... to monitor them through their recovery process until they are well enough to travel back to Australia." One of Australia's best road racers, Gillett was considered a medal favourite for next year's Commonwealth Games in Melbourne. "Amy was a unique athlete who represented at the elite level in two sports," Australia Olympic Committee president John Coates said in a statement. 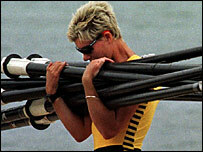 Competing under her maiden name, Amy Safe, she was a member of the Australian women's eight rowing team that placed fifth at the 1996 Atlanta Olympics. 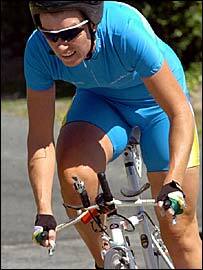 She switched to cycling in 2000 and was a member of the Australian World Cup cycling teams in 2002 and 2003. 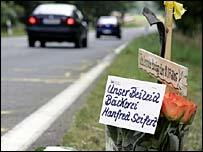 Organisers of the Tour of Thuringia have cancelled Tuesday's opening time trial and arranged a memorial service in its place. It is expected to be attended by all the competitors. The race will start Wednesday instead, with what would have been stage two, and run through the east German state of Thuringia before finishing on Sunday.